Neil McCafferty has signed for Warrenpoint Town. Pic by PressEye Ltd.
Neil McCafferty’s arrival at Warrenpoint Town is considered by manager Matthew Tipton another crucial addition towards establishing senior credentials. Last season’s Championship champions’ preparations for a return to top-flight football have included the capture of names with the past playing time Tipton is hoping can secure a bright future for Warrenpoint. 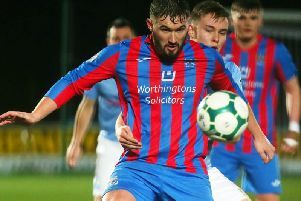 McCafferty marks the latest player capable of calling on an extensive career CV that includes time spent in professional football across the water - alongside appearances with hometown club Derry City on top of Irish League games in the colours of Dungannon Swifts, Portadown, Ballymena United and Coleraine - plus domestic minutes. Tipton has first-hand experience of McCafferty’s attributes on and off the pitch thanks to time together within one of the most talented Ports sides of recent seasons. “Neil walked into the Warrenpoint side for the first time during a midweek friendly against Banbridge Town and immediately offered examples of exactly what he can bring to the team and club,” said Tipton. “He has that specific skillset we need for that midfield role and his passing ability must have our attacking players so excited at the potential moving forward. “But Neil also offers that voice on the pitch and you could see in the hour or so he played how that leadership and ability to see the game will help bring out the best in his team-mates. Players like McCafferty, Alan Blayney and Sean Mackle offer Warrenpoint crucial experience as the Town attempt to adjust following a title-winning promotion push. “Youth development is a big part of our approach at Warrenpoint and we used quite a lot of guys last season who really enjoyed the benefits within that Championship run,” said Tipton. “But we understand we need experience on top of that potential to face the Premiership season and Neil and others in the squad can call on everything to help the younger players continue to develop in the right way.